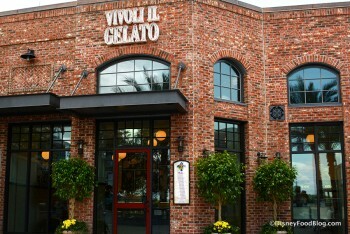 Vivoli Gelateria has just one other location in the world, and that’s in Florence, Italy. If you’re a fan of gelato, this might be one of the most exciting spots at Disney Springs! Vivoli il Gelato makes its gelato using the same recipes from the original family-run storefront in Florence and imports several ingredients from Italy including pistachios, hazelnuts, and cocoa powder. Guests will find traditional more than a dozen flavors of gelato on the menu in addition to panini, biscotti, espresso, and tarts. The menu features handmade gelato created using recipes from the original location in Italy in addition to panini sandwiches, waffle boat sundaes, Affagato, and fresh-baked torts. Switch Up Your Fall Flavors with this Disney Springs Maple Bacon Milkshake!